Supports: all generations of iPhone, iPad and iPod Touch with and without jailbreak; all versions of iOS from legacy to latest releases; legacy devices (up to and including iPhone 4) acquired instantly and regardless of lock/jailbreak state; logical acquisition with no passcode using a pairing record. iOS Forensic Toolkit for Mac OS X requires an Intel-based Mac computer running macOS from 10.6 (Snow Leopard) to 10.12 (Sierra) with iTunes 10.6 or later installed. All devices: Logical acquisition and media extraction are available for all devices regardless of jailbreak status or iOS version. Supports lockdown files for accessing passcode-protected devices. Physical acquisition of 64-bit devices does not decrypt the keychain. In order to access protected items such as stored forms, passwords and authentication tokens, physical should be always preceded by logical acquisition via iOS Forensic Toolkit. Logical acquisition is available for all devices regardless or hardware generation and jailbreak status. The device must be unlocked at least once after cold boot; otherwise, the device backup service cannot be started. Experts will need to unlock the device with passcode or Touch ID, or use a non-expired lockdown file extracted from the user’s computer. If the device is configured to produce password-protected backups, experts must use Elcomsoft Phone Breaker to recover the password and remove encryption. Elcomsoft Phone Breaker is also required to view keychain records. If no backup password is set, the tool will automatically configure the system with a temporary password (“123”) in order to be able to decrypt keychain items (password will be reset after the acquisition). ElcomSoft already offers the ability to access information stored in iPhone/iPad/iPod devices by decrypting data backups made with Apple iTunes. The new toolkit offers access to much more information compared to what’s available in those backups, including access to passwords and usernames, email messages, geolocation data, application-specific data and more. Huge amounts of highly sensitive information stored in users’ smartphones can be accessed. Historical geolocation data, viewed Google maps and routes, Web browsing history and call logs, pictures, email and SMS messages, user names, passwords, and nearly everything typed on the iPhone is being cached by the device and can be accessed with the new toolkit. 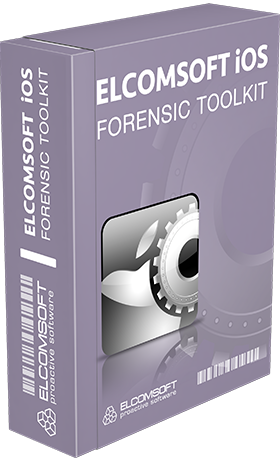 Elcomsoft iOS Forensic Toolkit can access iOS secrets including most keychain items, opening investigators access to highly sensitive data such as login/password information to Web sites and other resources (and in many cases, to Apple ID). During physical acquisition, keychain recovery is only available for 32-bit devices. The keychain can be extracted but cannot be decrypted when using the physical acquisition for 64-bit devices technique. However, the logical acquisition module will still extract the keychain. You’ll be able to decrypt the keychain if no backup password was set in the iOS device (iOS Forensic Toolkit will specify a temporary password, “123”) or if you are able to break the original password if one is unknown (with Elcomsoft Phone Breaker). Knowing the original passcode is never required, but may come handy in the case of iOS 4-7 devices (for iOS 8, however, it is required). The following chart helps to understand whether you’ll need a passcode for a successful acquisition. iOS 1.x-3.x: passcode not required. All information will be accessible. The original passcode will be instantly recovered and displayed. iOS 4.0-7.x: certain information is protected with passcode-dependent keys, including email messages, most keychain records (stored login/password information), and certain third-party application data. iOS 8.x-11.x: most information is protected. Without the passcode, logical acquisition is supported. Elcomsoft iOS Forensic Toolkit can brute-force iOS 4+ simple 4-digit passcodes in 10-40 minutes. Complex passcodes can be recovered as well, but require more time, as far as recovery is being performed right on the device and cannot be done "offline" on a faster equipment.